Winter is here and the hot chocolate is flowing. We hope you enjoyed the holidays as much as we have at Montag. Our letter continues to be presented in two sections, a brief overview of market returns and key news items, followed by a “Deeper Dive”, a more detailed view regarding one theme we find of particular interest. We hope you enjoy both. The fourth quarter of 2016 offered positive returns with modest volatility. The broad equity indexes were all positive. For the quarter, the S&P 500 and Dow Jones Industrials increased 3.8% and 8.7%, respectively, while the NASDAQ Composite increased 1.7%. For the year, the S&P 500 and Dow Jones Industrials rose 12.0% and 16.5%, respectively, while the NASDAQ Composite increased 8.9%. Interest rates rose for the quarter and the year. The yield on 10-year Treasuries ended at 2.45% compared to 1.60% at end of last quarter and 2.27% at the end of last year. The S&P 500 Index reached an all-time high in December 2016 after a strong showing in the second half of the year. Earnings growth for the index has been negative for multiple consecutive quarters but expectations have improved as the energy sector should move towards stronger profitability after more than a year of losses. Additionally, higher interest rates are expected to improve profit margins for many companies in the financial sector. The incoming Trump administration is expected to reduce regulations in many industries that should improve profit margins for those affected. The financial sector has been especially hard hit by increased regulations since the financial crisis in 2008. S&P Capital IQ reports that earnings growth for the S&P 500 Index is expected to be 12.3% in 2017 with revenue growth of 6.6%. The expected growth is encouraging but earnings estimates at the beginning of a new year are notoriously optimistic. From 2012 through 2016, actual earnings growth for the S&P 500 was about seven percentage points lower than the estimate one year earlier. If we adjust the current estimate using that historical error the result would be growth of 4%. Such big picture analysis is helpful for context but we prefer to spend the bulk of our time researching companies with above average growth prospects and valuations that are more attractive than the market as a whole. 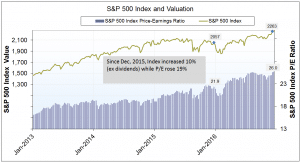 The P/E ratio of the S&P 500, an indicator of valuation, is still high and tempers the enthusiasm we have for some of the attractive stocks which we have found in the past quarter. As of the end of the fourth quarter, the trailing P/E of the S&P 500 is 26, up from 22 a year ago. The Federal Reserve voted to raise interest rates at the regular meeting in December, a move that was consistent with expectations. Several more increases are expected in 2017 but these will be dependent on the economic data that is released during the year. This “data dependent” posture is one the Fed has maintained since early 2016. 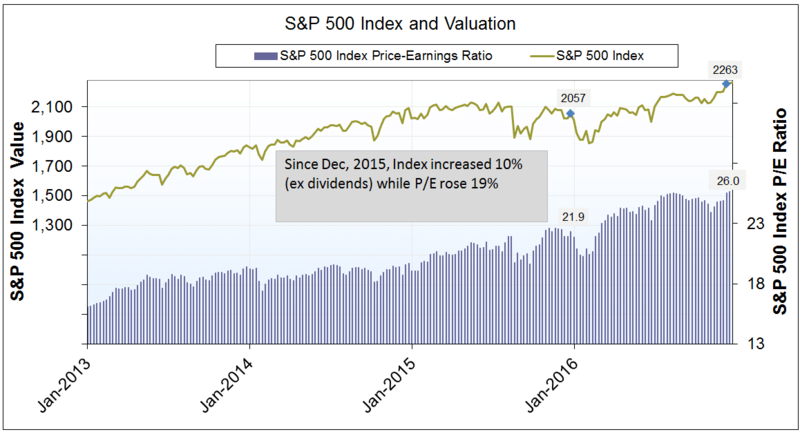 The high valuation of the major equity indexes is a measurement that we cannot ignore. If earnings growth in 2017 begins to materialize as expected the valuation will improve, but starting from a high level bears consideration. Several factors continue to offer comfort for equity investors. Market breadth, or the number of stocks that are participating in the market’s advance, is high which suggests the current upward trend is likely to continue. Additionally, information from the bond market shows that debt for riskier companies is performing well. This is often a good sign for equities. As always, our goal is to provide competitive returns to our clients with a focus on preserving capital during difficult periods. We believe our research process and discipline are an important part of achieving this goal. We would like to highlight a few news items that we believe are noteworthy. How will steps by the incoming Trump administration impact the economy (and stocks)? Much ink has been spilled in the last month in pursuit of this answer. We will offer a few of our thoughts and data we have gathered from reliable data sources in an attempt to answer it. Some comparisons have been made between Trump’s policies and their impact and the policies of the Reagan administration (1981-1989) that are often credited with strong economic growth. The expected tax cuts and rise in defense spending are two of the main factors that drive such a comparison. In 1980, the top individual tax rate was 70% and there were 15 tax brackets (not a typo). The maximum tax rate for long-term capital gains was 28%. By 1983, most income levels experienced a drop in tax rates of five percentage points while the top rate dropped to 50%. Tax rates are much lower now so a drop of similar size is unlikely and the subsequent boost to consumer spending would also be smaller as a result. Reagan also later raised taxes through changes in rates and deductions which muddies the data a bit. Furthermore, inflation and interest rates dropped dramatically in 1982 and again from 1984 through 1987 which makes it nearly impossible to determine the amount of the impact from Reagan’s tax cuts. Trade tariffs and tax policy for companies that import goods into the US are also a major topic. A “border adjusted” tax is expected to be part of any tax reform package for corporations. Such a tax would more negatively impact companies that manufacture goods outside the US then import them for sale in the US. The size of such a tax and the ultimate impact on companies that import has not yet been decided. Some believe that provision of the tax reform effort has a low probability of passing. If passed, it would be an incentive for companies to locate manufacturing in the US. Changes in corporate tax rates and deductions are also expected. The US has one of the highest corporate tax rates in the developed world but there are a number of deductions that reduce the ultimate rate that is paid by companies. In addition to lowering rates, it is expected that the Trump administration will pursue a tax repatriation holiday for companies with a significant amount of cash held outside the US. The last time such a holiday occurred was in 2005. Strategas reports that there was roughly $600 billion held by US companies overseas at the time and $300 billion was returned as a result of the holiday. That amount equaled 2% of GDP in 2005, a significant number. Strategas believes that as much as $1 trillion could be brought back to the US through a similar holiday today. This would amount to 5.4% of GDP based on recent economic data. If this were combined with other proposals such as higher tax deductions for capital spending it could offer significant support for economic growth. A counter argument for this benefit is that interest rates have been low for many years which made debt financing easily accessible to companies so the additional capital may not spur growth as much as expected. Repatriated cash may be used to reduce debt, pay dividends, or repurchase stock. Each of these would offer some benefits to investors. An increase in defense spending and infrastructure projects is expected as well but comparisons are more difficult without specific proposals. Forbes recently reported that the increase in defense spending could be $500 billion or more spread over a 10 year period. Increases in infrastructure spending have also been widely discussed. The American Society of Civil Engineers estimates that $1.4 trillion needs to be spent over the next 10 years to modernize roads, bridges, and other infrastructure. Trump has mentioned spending $800 billion to $1 trillion over the same period. The economic effect of such projects is likely to be far slower than any impact from lower tax rates, however. We believe watching government policy is important as a part of the investment process. However, we also note that estimating outcomes from such policies, especially before the policies are made clear, is incredibly difficult as there are far more factors involved than can be identified. We use such information as context for our analysis of well-run companies at attractive valuations. We welcome your thoughts and comments and are honored that you have chosen MONTAG to manage your investments. Thank you for the opportunity to be of service. We hope the additional material, focusing on transparent pricing in healthcare, is useful to you.